Register now for the 2018 Irrigation Show and Education Conference scheduled for Dec. 3-7 in Long Beach, California. You won’t want to miss this event-packed week that brings together professionals in turf and landscape and golf irrigation. 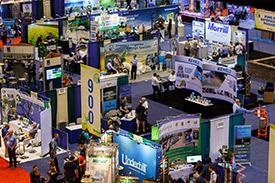 Join the 5,000 attendees and 300 exhibiting companies to get a first-hand look at the latest new technologies and products hitting the irrigation and specialty markets. Check out the respected lineup of education sessions covering the latest landscape topics, and make the most of valuable networking opportunities. Register by Nov. 1 to get the best rates. For more information or to register, go to www.irrigationshow.org.